Humans of Hampi. The people who bring life to the ruins city. This poignant poem has had me haunted for long. I am an empty Nester by choice but had the good fortune to mother a tiny brother. Those little fingers and soulful ‘welcome home’ smiles are assets for this life. How could I ever ignore the overpowering connection during my first solo trip to Hampi, a place that house ruins of an old city? Hampi had reached the zenith of prowess during 14th century. Long back, yes. But the glorious past was short lived with multiple attacks from Moghul emperor from Northern India reducing magnificent temples to dust and the sprawling cityscape to crumbling ruins. 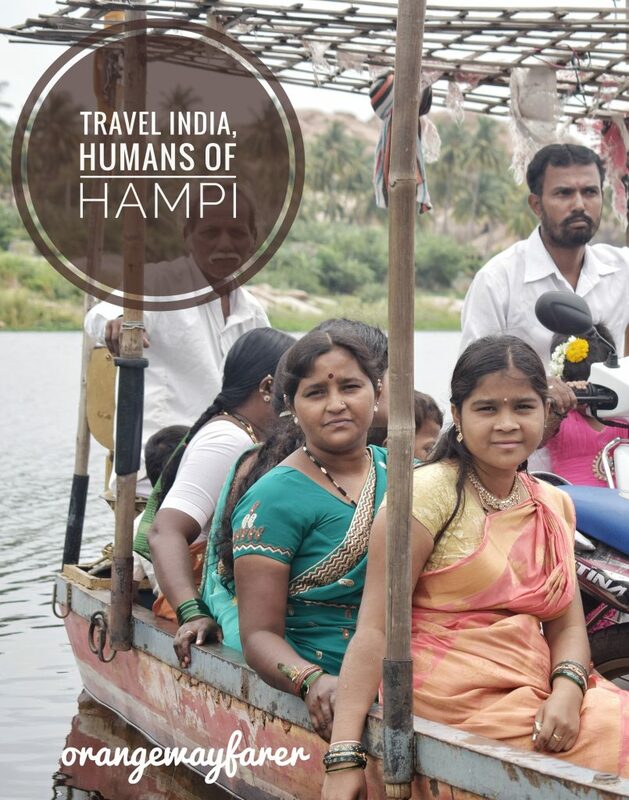 However spirit of Hampi lives on the banks of Tungabhadra river en masse. This is my small tribute to the amazing people I met there. before I could write anything about the city and the trip and the food I ate, I think an ode to Homo sapiens sapiens is only just. 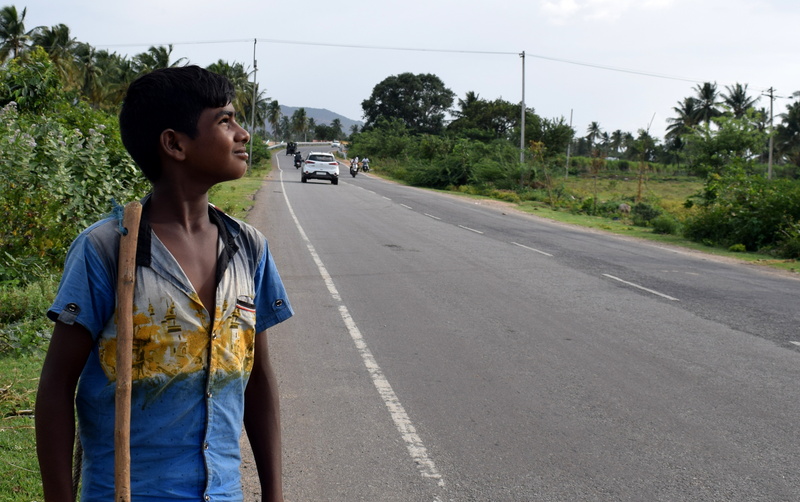 True the autowalas had lied to me left and right, and wolf whistles were blown when I walked alone on the forlorn highway. But I bring back these smiles too. I wanted to visit the river Tungavadra before heading to the ruins. The beautiful serpentine river, whose Ramayana name was Pampa, knows all the history. It is dotted with the remains of empirical pillars sparsely standing tall. I met these young ladies at one spot like that. Mansa’s mother wanted me to come with them to the other side of the river, to have lunch with them. “Chapati?” She asks me, for she knows no more of my language, neither do I. 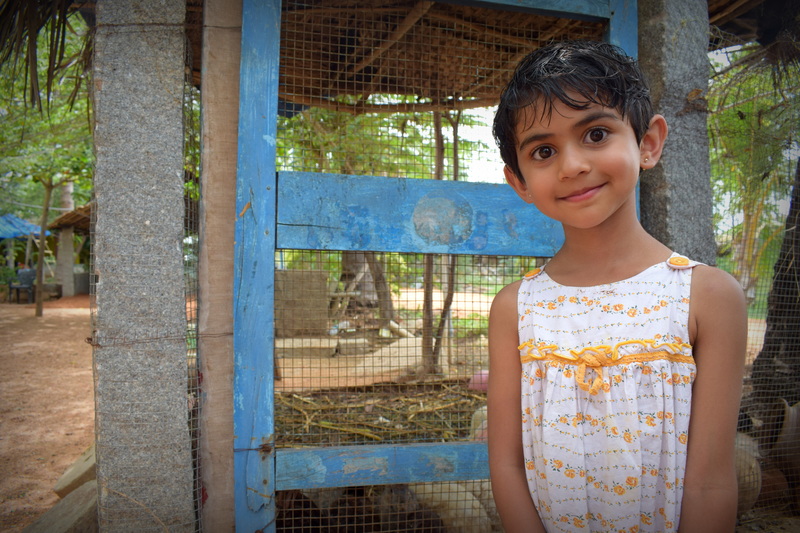 Meet Meera, “of course” she is an American born Indian child. Do not miss the sparkle in her eyes. For lunch, my auto driver, Mutthuswami took me to a nature-cafe. There are rabbits and peacocks, he tried to allure me. Now that I eat everything, I was of course excited at the possibility of tasting rabbit meat for the first time. Peacocks is India are notorious for tears. You better keep safe distance from them. “Akeli ladki, khuli tijori” (a solo women is an open box of treasure)! It turns out the restaurant is a vegetarian, or should I mention egg-etarian friendly one. Peacocks and rabbits are kept as pets. There I met Meera. we were feeding the rabbits with grass and chatting. Meera told, “I was in USA until last month, then I came to Bangalore. Of course I like it more over here.” Sigh! Children know nothing of the ordeals of Visa procedure. I made a friend while visiting the Vittalaswami complex. The boulders and a strategically located photo does not seem to be easily attainable in Hampi. I wounded my knee and the salwar was torn. With nonchalance, I was roaming around with that, for I knew a whole day awaits and it is for good I should not panic. A woman in saree approached me with a safety pin. She also gave me address of a shop at the market where i could find replacement. “We both are same, so is our Izzat” She told me. She speaks fluent English. I meet her again at the queen’s bath place. Queen has died and the bath place is dried. The woman with her family sits under a tree. She smiles from a distance. These smiles are infectious and soon i find myself sitting beside her. Gangabati is the village they are from. 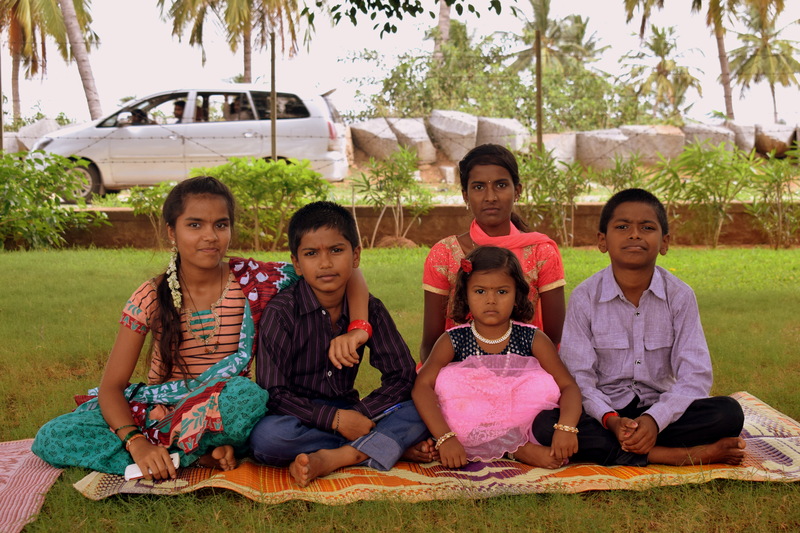 She is visiting Hampi with the mother in law, sister in law and many children. Kiran is his son. She wants me to click Kiran a nice picture. Kiran, clearly is disinterested in solo portrait and calls for his cousins group. Of course I lunched with them with sumptuous Sambar and lemon rice. The lime fragrance felt more refreshing with the genial companions. Yes, August is the month and we all are patriotic! Actually I was standing there to navigate google map to find a route to the secluded water-body. I knew there were a bunch of children at a distance, playing around a tree and a huge swing. The man in white shirt wanted me to click a photo with the faithful Boxer bike. Boxer bikes with extended mileage is a favorite choice of the villagers here. By the time I could set up the camera, I found myself amid these playful faces. “Which country” the boy in blue shirt asks! I say, “Kolkata”. They asks for pen, says thank you multiple times and just wants to see there photo once, not to possess it. I wonder what will happen once they will have necessary means to transfer photos. I loved the youngest lady of the lot. Her hair, her smile and earring. beauty personified! I could not enter Virupakhsha temple. I needed to remove my shoes and walk on the scorching stone. 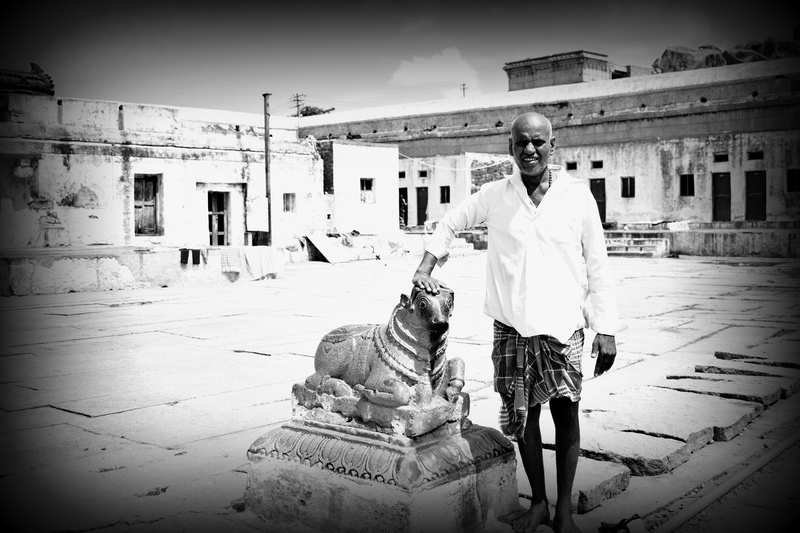 This temple is the only remaining of multiple institutes from Vijayanagara with regular worship. I am not a believer. However it fascinates me to witness devotees to bow down to a faith they perceive in their mind or feel through a stone sculpture. I found this man to worship Shiva’s bull for good five minutes. I wonder what he must have done inside the temple! ‘রাখাল ছেলে! রাখাল ছেলে! বারেক ফিরে চাও, বাঁকা গাঁয়ের পথটি বেয়ে কোথায় চলে যাও?’ A poem by Jaseemuddin that asks the shepherd where is he going! He came to me when i was walking past an empty road and multiple bikers wistled past. he asked me “where to?” I pointed to the water-body. Now this boy must have been ten years younger than me, and we do not even speak same language. But he came, concerned and helpful. An i fell in love with Hampi again! [So I have recently been traveling a lot! 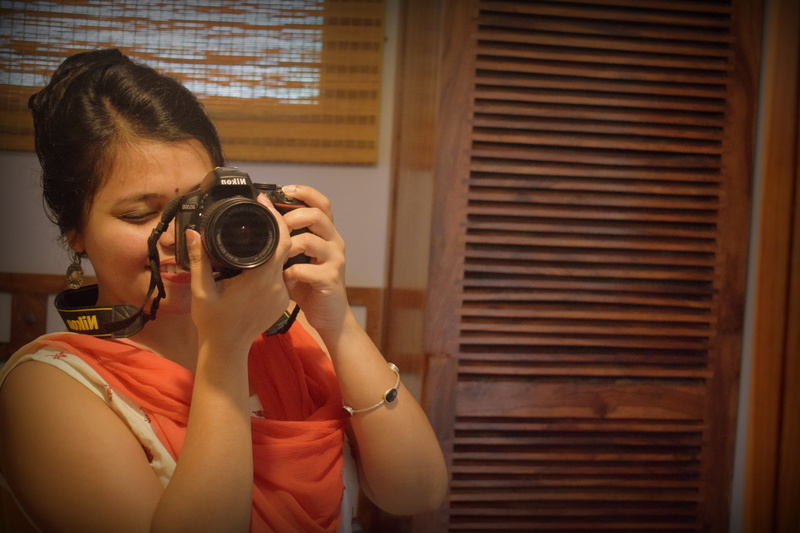 Hampi, Goa, and now preparing for Kolkata Durgapuja and also juggling time balance with office and new You tube project. Result? Painful absence from my blog. I am yet to finish about Thailand, Pattaya and Thai food accounts in details. Hampi trip needs to be written in detail for the fascinating history the land commands. And of course, the monsoon in Goa! That too with my best friend’s infant son!And of course with the best friend too! It is kind of re writing the to do lst. My walls, my office desk, pot it notes, google docs and now they have crawled into the blog page too. So much to do, so little time! Update Guys! Here is my brand new YouTube Video channel. In case you have liked my blog post, do go and check out the YouTube movie as well! I just love Hampi. How long did you stay there? I stayed for only 1 night. But I wish to go back again 🙂 I did not visit Anegundi. Did you visit that area? Thanks again! I only visited Hampi. We arrived in the morning and returned by evening. Would definitely recommend a 2-3 day trip for Hampi. There’s too much of history and culture to cover in a day. We were super tired by the end of the day. The photographs are lovely. 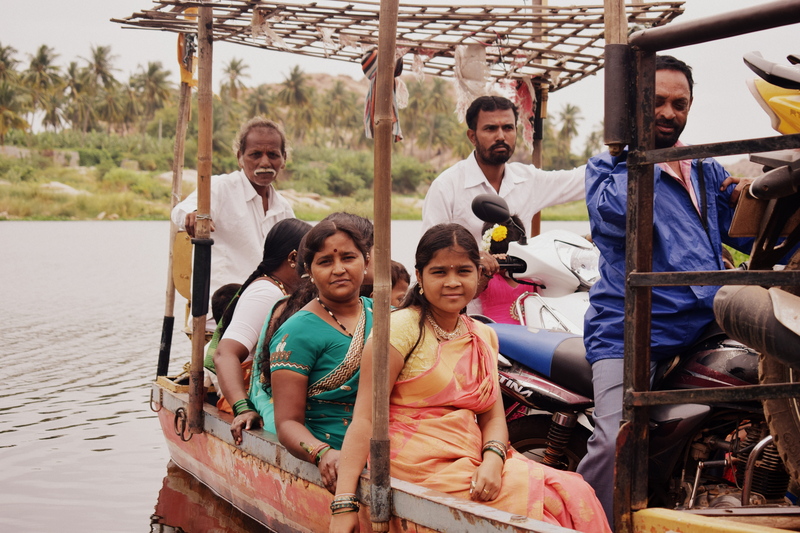 You’ve captured that side of Hampi that people otherwise talk so little about. The photos are lovely and you have a lovely style of writing. Plus, the poem at the beginning was beautiful. Very haunting, but beautiful. I love reading about places I have never been or what have thought of visiting, it always seems to make my bucket list grow some what. The poem, I read five years back. I still remember every bit of it. It is love! These images are amazing! Goodluck on more travel and vlogging, of course! Not everyone can do what you are doing now. ? That is great! Do let me know if you need any suggestion. Welcome to India! What a great trip! Would love to go there! Thanks so much for sharing! Thank you. 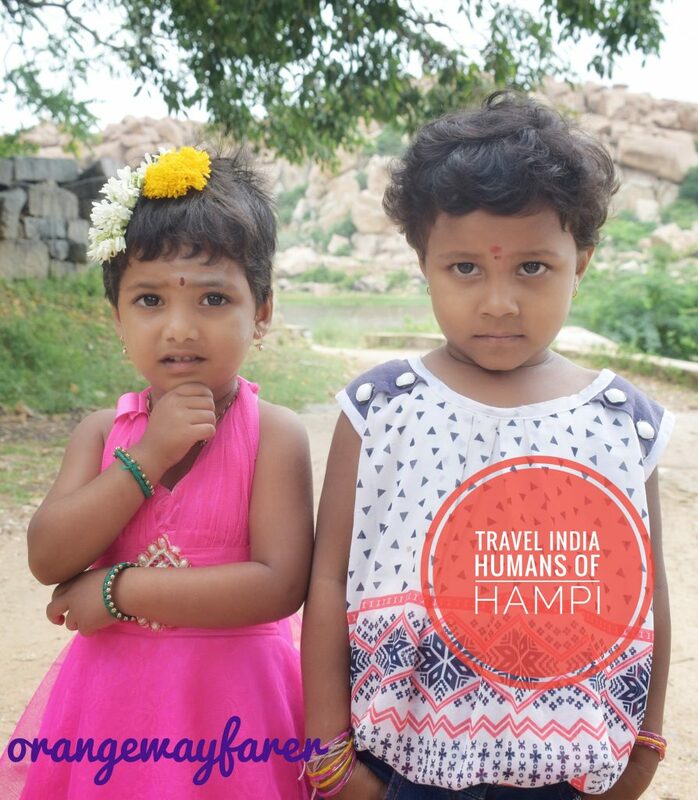 Please visit Hampi. What a beautiful post, it made me really want to go to India directly and discover it myself!! great video!! well done..Good luck! Your photographs are beautiful and very inspiring!! Please visit India and let me know beforehand. I would love to host you. Your post is very descriptive! And the pictures are fantastic! It must be fun to travel about. Great read. I love how you captured the true essence of the place in your pictures. So nice! I needed to find this post tonight. Thank you for sharing. One of my personal travel maxims have to do with the people I meet during my trips. I started to travel because I wanted to see sights, monuments and natural wonders. However, I discovered that the people of those places surpass all those things I wanted to see. The interactions I have with other people is what I remember the most. 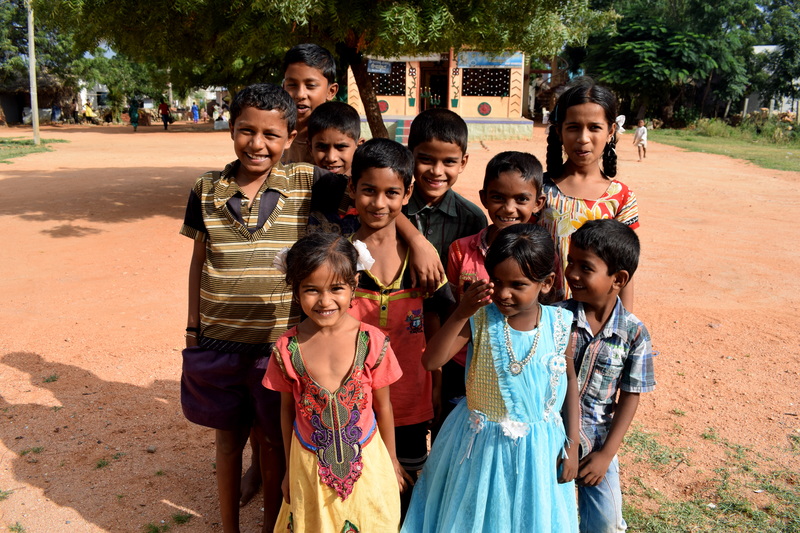 I am glad you found tons of beautiful people in Hampi. Beautifully written! Love how you have captured the side of Hampi that’s barely spoken or written about..
Love hearing about new places like this ! Beautiful writing ☺ Your video & photos have perfectly captured the beauty of this area. I’ve got the feeling that like Mecca is for Muslims, every Hindu must visit Hampi at least once in their lifetime, right ? You may probably spent days visiting all the ancient temples that are spread out over miles across the incredible area ? Umm.. Hindus prefer active worship places like Vanaras or Hardwar or Kalighat or Tirupathi more than the ancient ruins (also I am not a believer) however Hampi should be visited by everyone to understand why noone should ever destroy anything beautiful! To visit everything about Hampi you need around a week’s time I guess. I shall be posting about Hampi in detail very soon! Beautiful pictures ? Hampi is special, it was my first ever solo trip destination! ? Oh my! I love your writing and sentiments. That is an amusing and apt poem that you opened with. Part of what I love about traveling solo is how open it makes you to meeting the locals in your travels. Seems you met some wonderful ones here. great pictures and lovely description! Wonderful narration and beautiful photographs! 🙂 Thank you for your kind words 🙂 The place has beautiful people.